The rough program is to arrive on Friday night. Saturday, weather permitting, ride to Bright & back. Sunday, Omeo & back. If it's awful weather, we can car shuffle to Harrietville or Dinner Plain, and ride from there - maybe do Tawonga Gap, or a long flat ride to Wang & back, or similar. Sprinters or those alergic to long hill climbs can do sprint training on the road opposite the lodge (that's what I'll be doing!). If you have Google Earth on your PC, you can see Jim Crumpler's GPS tracks from when he came on the camp in November 2005 here. On Saturday night we'll have some good cycling related movies to watch. Most of you have been on one of these already, so you know the terrain and the venue. Rolling down the last bit into Marouka after riding all the way up the hill is a very rewarding feeling indeed. I am the world's worst climber, and I can get up it, it's just a case of putting your mind to it and keeping your pedals turning! If you've never attempted anything of this scale before, it's an incredible feeling to top out at the summit after climbing a category 1 mountain. A number of riders surprised themselves last time and I'm sure have fond memories of getting up the beast, and if you have done it before, this is a chance to do it faster! * Bike (duh). I'll take some basic tools etc to do minor repairs only, so please make sure your bike is in good shape. In the past we've had broken spokes (Shimano wheels ... ) and minor mechanical problems - if you have a spare wheel or two, you may want to bring them. * Spare brake pads - the descents off Hotham are quite a lot of fun, and are very hard on brakes and rims if wet. Please make sure your wheels are in good condition, not too worn on the rims. * bidons/water bottles and riding food. The climb up Hotham from Harrietville is 30km, and there's nowhere to refil or stop for food if you run out of steam on the climb. It's 50km from Omeo, so both rides are long and if you choose to ride the whole way, you'll want plenty of food. * sleeping bag or sheets and pillowcases - the lodge has bunk beds and 8 rooms for us to share. There's bedding, but please BYO sheets. But in November 2006, we had 36 degrees of hot and very dry. You never know in the mountains, what you might get. * Your own breakfast and lunch for Saturday and Sunday, and snacks and riding food. What you can buy on Hotham at the top is expensive, and limited in range. The lodge has fridges and food storage areas and a well equiped kitchen. We do have to clean up after ourselves, so anything that involves a lot of saucepans for breakfast is probably not such a good idea. If you're a vegetarian, please let me know, Saturday's dinner will be a tomato & meat sauce & pasta, but I can make a vegetarian option if anyone wants it. * a climbing cassette (bike gears) if you can. I recommend unless you're a gun climber, at least a 25 tooth cassette for a road bike, unless you have a triple chain ring or are bringing a MTB instead!. Some short parts of the climb are more than 10% gradient. I can get up it on a 25, but a 26 or a 27 means you can spin up CRB hill rather than grinding. * Helmet, sunscreen, sunglasses, bike pump, tyre patches etc .. the usual riding equipment you take on any long ride. * books to read etc. When we get back in the afternoon and relax at the lodge, you can read, go for walks, check out the resort etc. There's a TV in the lodge and we'll bring a bunch of cycling DVDs so we can play Paul Sherwin bingo. Non-riding bodies will definatly want to bring something to do for if the weather closes out. Bring some walking shoes and clothes, it's a beautiful part of the world and there's loads of good walking tracks. * mobile phone. We will come and get you if you get stuck, but we're not running a formal sag wagon. Call for help! I'll give everyone a phone number on Saturday morning. If you don't have a mobile phone, make sure you're riding with someone that does, or that you can get to the top! We've got a pretty broad spread of riders, so I think that shouldn't be a problem. This is *not* a supported ride like a bike tour. We'll come & get you if you have a problem, but you'll probably have to wait a while! What will we do if the weather's awful? If it's wet, we won't ride down the hill (you can, I'm not going to try to stop anyone, but it's a tricky enough descent in the dry. If you crash, don't sue me!). We'll organise a car shuttle to get bikes and riders down to Harrietville and we'll ride out from there, and then ride back up the hill. If it's really yuk .. I hope it's not really yuk! I can't offer refunds on the accomodation! What will we do if the weather's great?! Ride! One suggestion is to roll down to Harrietville, and some of us will push on to Bright, before turning around and riding back up the hill. So, minimum of 60km, 30km descending, 30km climbing. Maximum of pretty-much as much as you want to ride. If you don't want to go all the way down (and thus, back up!) you can choose to ride to Dinner Plain or the tollbooths, which is a lot less distance, but still moderately (dinner plain) or very (tollbooth) hilly. Sunday, same thing, except we'll ride towards Omeo via Dinner Plain instead - this is a much less steep climb, but a lot longer. 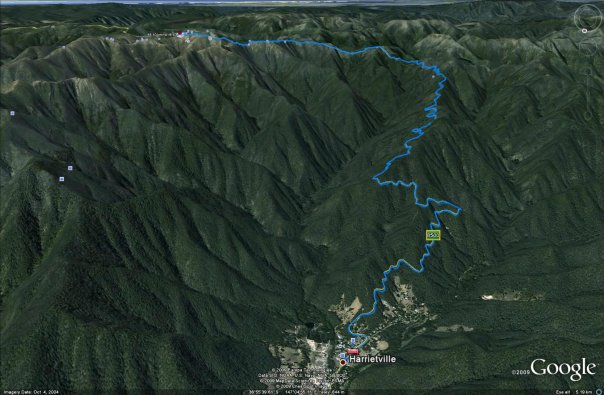 Omeo and return is a shade over 100km, and involves climbing 2200m in total. It's a big day at the office, again, shorter options are yours for the taking. The hardest part of this way is the first climb out of Omeo on the way back, the rest is a gradual climb without too many steep sections. On both days I'd expect everyone to be back at Marouka by mid afternoon at the latest. We'll come looking after 5pm. The important thing is that you're riding at your own pace and your own responsibility. This is not a coaching weekend where I'm taking responsibility for where and if you ride. I've organised the accomodation and suggested an itinerary and will make sure you get a good dinner on Saturday night. that's it! Sunday night we all drive home. I can highly recommend the Ovens Hotel for dinner! We want to leave Marouka by 4pm on Sunday to try and be back in Melbourne by 9pm. I will be at Marouka at around 9pm on Friday night, traffic and work permitting. It's about a 5-6 hour drive from Melbourne to Marouka. In the past we have been pretty late getting there - if you get there before me don't panic. If you're running very late please call me and let me know - 0419 966 003. I'll wait up but the later you get there, the less likely you are to get the room you want! We have small dorm rooms to share. Please do try and get there before midnight, and if you're early, and someone arrives late, please don't be offended if they move into your room! Marouka is situated just off the main road, near village transport and intermediate ski access trails. The lodge is located about 1 km past the Hotham village on the road to Omeo. If you are coming from Harrietville, the Big D complex is on your right. Another 400 m further on is an illuminated beer sign above the Jack Frost restaurant and ski hire. Marouka is the second lodge after Jack Frost. In summer you can park right outside the lodge.